Fans of punch-em-up fighting games rejoice, because the most anticipated action game of the year is now available for free download! 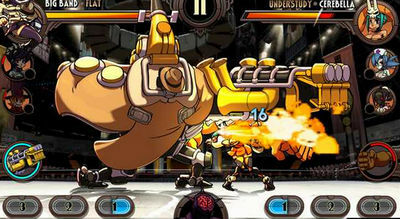 Skullgirls (android game), developed by Lab Zero Games, is a 2D fighter with tactical, turn-based combat elements such as story progression, customization, team/deck building mechanics and a Fight Assist feature. If you've already played the game on other platforms, this mobile version has an RPG twist to it which will reel you in instantly. Collect and customize Skullgirls characters such as Parasite Weave Filia and Resonant Evil Big Band, then take them to battle. You also have a new Fight Assist feature that lets you take on a more turn-based, tactical role in combat! Skullgirls puts you in control of fierce warriors in an extraordinary Dark Deco world. Featuring all-new game systems which test the skills of veteran fighting game fans while also making the genre enjoyable and accessible to newcomers. No Google Play link at this point! A gameplay video will be added soon! Install any Apk, Extract Data and copy ‘com.hiddenvariable.skullgirls’ folder to sdcard /Android/data/ , and run the game.